Zen Cho's well-written, easy-to-follow narrative piqued my curiosity of Sun Wukong's historical existence. I enjoyed this small adventure of Sun Wukong but found myself not able to fully enjoy the story while I had so many questions about its main character. Cho's obviously intimate understanding of Sun Wukong's established fable left some holes for the reader. It appears as though she wrote the story for a reader who is not only familiar with the historical origins of her character, but that they are familiar with the narrative style associate's with her character's origins. This story read like a Buddhist tale or a Taoist fable, simple and clear. At around 5500 words, I found it rewarding to read the story up front, research additional information on the character and author, then read again from a more informed perspective. I'm happy to report that while the second reading experience was enriched by knowledge of Sun Wukong's origins, the first reading experience maintained a childlike enjoyment that could not be replicated once I had additional knowledge. Sun Wukong, the great Monkey King, is a fabled character whose origination dates to the Chinese Chu kingdom (700–223 BC).source He has served as a Taoist god and a Buddhist figure, and is said to be influenced by the Hindu diety Hanuman. For anyone enjoys historical fiction, speculative fiction offers a unique and perspective-challenging shift. Monkey King, Faerie Queen acts as a psuedo-backstory for Sun Wukong. Seeing historically-significant and fabled characters in a fresh light invites us to form new insights from their journey, challenges, and development. I find that I learn more about a character or a historical figure through speculative fiction, as it boldly goes (typically based on research) where nonfiction cannot. An enjoyable, stimulating, and propelling read! 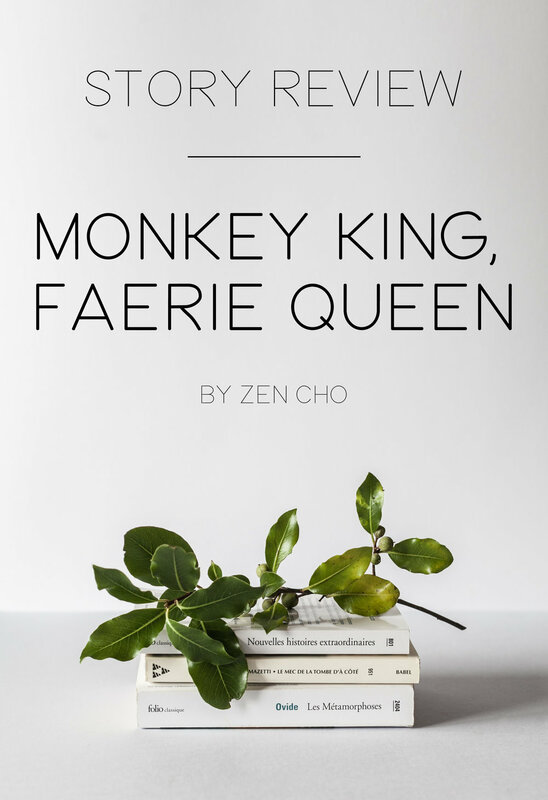 I invite you to read Monkey King, Faerie Queen by Zen Cho and to delve deeper into your favorite myths simply by imagining their existence outside their established paradigm.